The Lonesome River Band are a veteran band on paper, but have seen many changes of personnel over the years. As one expects from this band, the instrumental playing is brilliant but tasteful, with banjo star Sammy Shelor anchoring the sound. Both the current lead singers are outstanding too – the smoky characterful baritone of Brandon Rickman (one of my favorite singers across country and bluegrass) almost matched by the strong, if less distincive, tenor of Jesse Smathers. A number of well known country songs get a bluegrass treatment . Crystal Gayle’s early hit ‘Wrong Road Again’ is delightful. The Don Williams hit ‘Old Coyote Town’ is given an absolutely beautiful reading by Brandon Rickman. Western Swing classic ‘Ida Red’ becomes a pacy bluegrass romp. A less well known cover, ‘Hickory Hollow Times & County News’ was on Charley Pride’s 2011 album Choices. Rickman’s warm vocals suit the song’s sweet nostalgia. It was written by Don Humphries. The atmospheric title track, an Adam Wright song based on a true story, is about a rural Georgia psychic from the mid 20th century, to whom the album as a whole is dedicated. ‘Diggin’’ is a pretty good mid-tempo song about struggling to make ends meet that manages to sound bright despite the despairing lyric. The similarly upbeat ‘As Lonesome As I Am’, written by Matt Lindsey and Shawn Camp, is a more overtly optimistic song about expecting things can only get better. ‘I Think I’m Gonna Be Alright’ sees the protagonist coping well enough with a breakup. Some fantastic fiddle (from Mike Hartgrove) leads the fast paced ‘Lonesome Bone’. ‘It Feels Real Good Goin’ Down’, written by Gary Nicholson and Shawn Camp, is a vibrant drinking-away-the-pain song. Thw album closes with a frenetic arrangement of the bluegrass standard ‘Fly Around y Pretty Little Miss’. This is an excellent album which should appeal to country fans with an interest in bluegrass. It’s a scenario that’s familiar to every country music fan: an up-and-coming artist breaks through with a traditional record and is heralded as a “savior” that will return the genre to its roots. In interviews, he/she pays homage to Haggard and Jones, etc., etc. Then a few albums down the road, the same artist moves to a more mainstream pop (or at least less country) sound in order to expand his/her commercial appeal. The artist denies doing so, even though it’s blatantly obvious to everyone what’s going on. Wynonna Judd began distancing herself from country music as soon as The Judds disbanded. It can be argued that The Judds themselves were becoming less traditional with their last two studio albums, but the the process got underway in full when Wynonna launched her solo career. 1997’s The Other Side was a completely non-country album and the same can be said of its follow-up New Day Dawning, which was released in 2000. In Wynonna’s defense, the change in musical styles seems to be less of a crass grab for pop airplay and more of a reflection of her true musical tastes. Unfortunately, her tastes are at odds with mine, which makes New Day Dawning difficult to review fairly. I’ll admit to feeling irritated while listening to it, not so much because it isn’t country, but because it was marketed as country. While artists have every right to experiment with other styles, it would be nice if they would occasionally throw a bone to the country fans who supported them from the beginning by including one or two more traditional songs on their albums. It rarely happens, though, and it certainly does not happen here. New Day Dawning finds Wynonna working with a new production team — James Stroud and Gary Nicholson — and sharing production duties for the first time. This is not a country album, nor is it an Americana or roots album. It’s mid tempo soft rock similar to what is played on the radio stations playing in the background in any dentist’s office. If you like synthesizers, saxophones and horns, this is the album for you. While there are some country elements on the opening track and the album’s second single “Going Nowhere”, but they are drowned out by the “nah-nah” background vocals. Still, it is catchy and the logical choice for a single. Country radio wasn’t impressed; the single stalled at #43. Overall, I liked the album’s ballads better than the mid- and up-tempo numbers. “Can’t Nobody Love You (Like I Do)” is a pretty, AC-leaning number that served as the album’s lead single. It seems like an odd choice for a lead single, though, and it only peaked at #31. “Learning to Live With Love Again”, written by Gary Nicholson and Mike Reid is also quite good, and so is “Who Am I Trying To Fool”, although I would have greatly preferred it without the intrusive synthesizer. The title track is one of the album’s better uptempo cuts — more Memphis than Nashville — but the background vocals sometimes border on bombastic. I disliked the funky “Chain Reaction”, another Nicholson co-write, even though it actually has some fiddle on it. Before I even heard “Tuff Snuff”, I was annoyed by the spelling. It’s a remake of a 1986 song by the blues rock band The Fabulous Thunderbirds. Wynonna’s voice is too husky on this one; she seems to be singing at the very bottom of her register, the complete opposite of her syrupy vocals on her remake of Joni Mitchell’s “Help Me”. I would not have been able to identify the singer of this song if I hadn’t already known. I intensely disliked the closing track “I Can’t Wait To Meet You”, a spiritual number co-written by R&B singer Macy Gray. Overall, I did not enjoy this album and I do not recommend it. To be fair, though, it isn’t a bad album, just not my cup of tea. It was Wynonna’s first album not to earn gold or platinum certification and marks the acceleration of the commercial decline that began with The Other Side. The original pressing of the album included a four-song EP of The Judds, which I have not heard but I assume is much better than the main album. 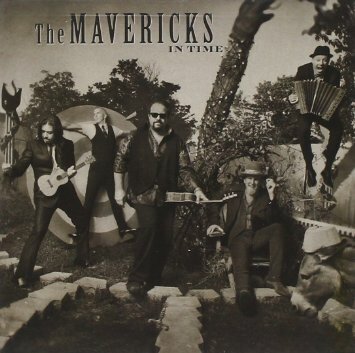 After almost a decade ploughing their individual furrows, the Mavericks reunited in 2012 and released a much-anticipated comeback early in 2013 on Valory Records. Arrangements are generally heavy on the horns, and the songs, all written or co-written by Raul, don’t quite stand up with the best of their earlier material, but it is a solid record filled with energised performances by a band clearly happy to be back together. The lead single ‘Born To Be Blue’ is quite good, but didn’t crack the top 40 on the country airplay chart. The only other single, ‘Back In Your Arms Again’, a co-write with Gary Nicholson and Seth Walker, has a strong Latin influence, and didn’t chart at all. ‘Lies’ is an up-tempo country rocker, written with Al Anderson and Bob DipIero. It’s an excellent song lyrically, but lacks melody and the arrangement or mix is too loud and relentless. ‘Come Unto Me’, sung partly in Spanish, with a full-on Spanish version tacked on to the end of the record, incorporates Latin and rock aspects, and is pretty good. ‘As Long As There’s Loving Tonight’ and ‘Dance In The Moonlight’ are examples of the band’s feelgood party numbers – enjoyable and no doubt even more so live. By far my favourite track, ‘In Another’s Arms’ is a tender ballad showcasing Raul’s voice at his soaring best and is tastefully produced. The languid ‘Forgive Me’ is another beautifully sung ballad. ‘Amsterdam Moon’ and ‘That’s Not My Name’ have a retro pop feel which is not my cup of tea, but well done. I enjoyed ‘Fall Apart’, which has a bouncy polka-style accordion-led accompaniment backing an unrepentant lyric about risking hurt for the sake of love. ’All Over Again’ has a similar joie de vivre, and a lyric about defying a helpless love for the woman who insists on breaking his heart repeatedly. At over eight minutes, ‘Call Me When You Get To Heaven’ is far too long while not really getting anywhere interesting, and feels self-indulgent to me. This isn’t a particularly country album, but is it is an enjoyable one which fans of the band should catch up on if they missed it. San Angelo was Aaron Watson’s sixth album and his first album to reach Billboard’s Country Albums chart, peaking at #60 in 2006. From this point forward all of Aaron’s albums would receive nationwide exposure. The album opens up with “Heyday Tonight” a good up-tempo country honker that would have fit in the repertoire of any dance hall band of the period. Aaron composed this song as he did the second song on the album “Good Thing Going” about a good love that got away due to the narrator’s failure to tend to business. It’s a bit lightweight in terms of lyrics, but it is pleasant listening. The third song finds Aaron covering a Frank Dycus – Jim Lauderdale composition “In Harm’s Way” that could easily have been a hit for someone. Frankly, I would have expected George Strait to have wound up with this song. Aaron co-wrote “3rd Gear & 17” with Drew Womack, another song of lost love, this one with a football backdrop about a fellow who left to play college football, losing the girl he left behind. “Unbelievably Beautiful” is another Aaron Watson composition, with a laid-back, almost jazzy vibe to it. While I don’t think the song had any potential as a single, it makes a nice change of pace within the context of the album. “Haunted House” is another Watson composition, this one a fine mid-tempo exposition of a love gone wrong. Willie Nelson has written many fine songs in his long career. “I’m A Memory” wasn’t a huge hit for Willie (#28 for Willie on RCA in 1971) but it was always one of my favorite of his songs. Aaron does the song justice with an arrangement similar to Willie’s arrangement but with steel guitar and fiddle added to the mix. 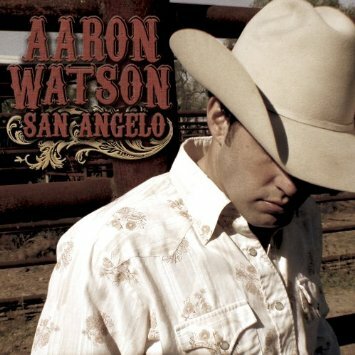 The title track “San Angelo” is one of those hard-edged about love and heartbreak that Aaron writes so convincingly. The medium-slow tempo fits the song perfectly. “Except For Jessie” is Aaron’s wonderful tribute to Waylon Jennings and his lady Jessi Colter . The song is a four minute biography of Waylon’s life. Although a bit of a novelty, with a sound reminiscent of some of Waylon’s songs, it is an effective song. I doubt Waylon ever got to hear the song (I don’t know when it was written) but he surely would have approved. Bruce Robison wrote the slow ballad “Blame It On Me”. It’s a nice song, and Aaron gives the song a proper reading. ‘All American Country Girl ” is the worst song on the album, a lightweight piece of fluff that is would work well on the dance floor. It’s not bad – I’d give the song a C+ – but the rest of the album is better. Buddy Holly’s “True Love Ways” was an interesting choice for Aaron to cover. I am afraid that Buddy is slowly being forgotten as I hear no trace of his influence in today’s country music whereas through the 1980s it was fairly common for his songs to pop up on country albums. Mickey Gilley’s cover of this song in 1980 went to #1 and Peter & Gordon had a #14 pop hit with the song in 1965. I really like Aaron’s recording which nicely combines fiddle and steel as well as featuring more piano that the rest of the album. I thoroughly enjoy this album from start to finish each time I pull it out to play. I’d give it an 4.5 stars. Ray Benson produced the album, and this is a country album – no doubt about it. Brown had fought a longstanding battle with alcohol, and this intensified after he lost his deal with Capitol. Having overcome it with the support of his wife Sheila, he returned to music in 1998 with the independent Wine Into Water, co-produced by his old friend Gary Nicholson. Could you help me turn the wine back into water? The song was a big success o the Christian country charts, but the lack of major label muscle stopped it from repeating the feat on mainstream radio. Almost as good is the melancholic ‘Keep Me From Blowing Away’, a wonderful Paul Craft song once recorded by Linda Ronstadt and also by Willie Nelson. Brown’s version features Marty Stuart on mandolin and showcases his own emotional vocals. Nothing else is quite as good, but I enjoyed ‘Happy Ever After’ (a non-charting single for Gail Davies in 1990). Brown’s version is beefier, both in terms of the production and his vocals, but the latter give it a real emotional heft, focussing on the slog of building a love into a life together. I also liked the rockabilly piano-led ‘Hide And Seek’ and the soulful ‘Accept My Love’. ‘A Better Word For Love’ is a jazzy loungy ballad which makes an interesting change of pace. ‘Good Days, Bad Days’ is a bit dull. ‘Never In A Million Tears’ is very powerfully sung but an average song. ‘How Do You Know’ is a black gospel tune which is also well done. The funky and partly spoken ‘Memphis Women And Chicken’ comes across as self-indulgent to me, but will appeal to those who like that style. The shouty ‘Livin’ On doesn’t do anything for me either. 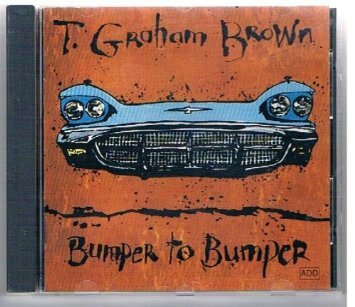 This album contains two great tracks, and a number of good ones, and is Brown’s usual mixture of stylings. 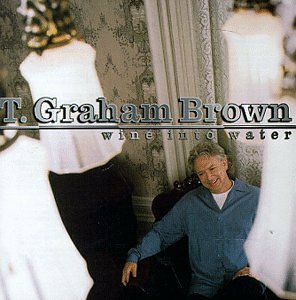 T. Graham Brown took on production duties for his fourth album, released in 1990, alongside Barry Beckett. The production is mellow with strong blues/soul influences, but quite tastefully done. The lead single, ‘If You Could Only See Me Now’, written by Susan Longacre and Rick Giles, peaked at #6. It was a ballad with a strong vocal about a man who has changed his life around too late to save his marriage. The second single, a more mellow ballad ‘Moonshadow Road’ looks back fondly at teenage romance. It was a top 20 hit, and although heavily loaded with saxophone it is a very nice song. The third and last single, ‘I’m Sending One Up For You’, written by Brown with Gary Nicholson and Ray Kennedy, unfortunately flopped. It is a sincerely delivered love song about praying for a former lover’s happiness. The mid tempo ‘You Can’t Make Her Love You’ is a great song about an elusive woman, written by Jerry G. Ward and effectively sung. ‘I’m Expecting Miracles’ is a prettily melodic romantic ballad written by Brown with Verlon Thompson and Gary Nicholson. The second half of the album is pretty much entirely blues/soul rather than country. A cover of soul classic ‘I’ve Been Loving You Long’ is quite well done. Brown’s idealistic ‘Bring A Change’ is in similar vein musically, with a very long sax solo. I like ‘Blues Of the Month Club’, which is atmospheric and cleverly written but goes on a bit too long. ‘Eyes Wide Open’ and ‘For Real’ are boring all the way through. The closing ‘We Tote The Note’ is about touring as a musician but is definitely too blues for me. 2001’s Scarecrow was the last full-length studio album that Garth released before his long sabbatical from music, and like most of his albums, it is an eclectic collection encompassing a variety of styles, although there seems to have been more of an effort to appeal to country fans than on past projects. The lead single, “When You Come Back To Me Again” was originally included on the soundtrack to the film Frequency. Written by Garth and Jenny Yates, it is an AC-leaning ballad, and despite the overwrought string arrangement, it’s one of Garth’s better non-country efforts. It was apparently a little too-AC for country radio. It peaked at #21, becoming one of a very few number of Garth Brooks singles to miss the Top 20. Before the album was released, Capitol dug back into its archives and went back to Garth’s 1990 collection No Fences, and released “Wild Horses”, with a newly recorded vocal track, as his next single. Then it was back to Scarecrow for the catchy and sparsely produced “Wrapped Up In You”, which became the album’s biggest hit, peaking at #5. It was the only single from Scarecrow to reach the Top 10. It was followed by a shouty duet with future wife Trisha Yearwood, the Delbert McClinton-Gary Nicholson tune “Squeeze Me In”, which reached #16. Garth makes his best attempt at a Delbert McClinton impersonation, but sounds out of his element here. Trisha sounds slightly more at home. “Thicker Than Blood”, a nice midtempo number again penned by Garth and Jenny Yates, deserved more attention than it received. It peaked at #18. Like much of Garth’s work, Scarecrow is a mixed bag. It’s a very incohesive album as Garth attempts to appeal to every niche of his vast fanbase, and in doing so often comes across as insincere. There is the exaggerated twang on the more country numbers like “Beer Run”, a novelty duet with George Jones that wears thin after the first listen, the complete lack of a twang on the overblown power ballads like “Mr. Midnight” and “The Storm” and the awkward attempt to be a bluesman on “Squeeze Me In”. It all leaves the listener wondering just who the real Garth Brooks really is and what kind of music would he really have made had he not been so obssessed with breaking sales records. That being said, Scarecrow has more than its fair share of enjoyable moments. “Pushing Up Daisies” is a nice cover of a Kevin Welch tune from 1995 and should have been released as a single. “Don’t Cross The River” is a countrified version of a song originally recorded in 1972 by the pop group America. The arrangement features a lot of banjo, dobro and fiddle and it works surprisingly well, and “Rodeo or Mexico” is a very enjoyable number written by Garth with Paul Kennerley and Bryan Kennedy. Scarecrow is probably one of Garth’s more forgettable albums but on average the plusses outweigh the minuses. Garth fans will like it and even more casual listeners will find plenty to enjoy. 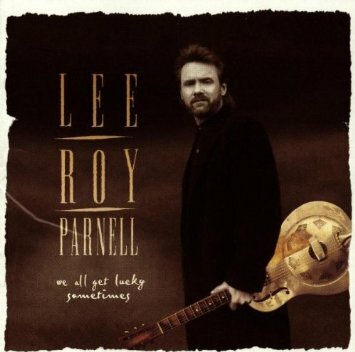 Lee Roy Parnell released his fifth album, Every Night’s A Saturday Night, in June 1997. Parnell co-produced the project, his second release for Arista imprint Career Records, along with his touring band The Hot Links. The album produced three singles yet failed to generate any top ten hits. Parnell and Gary Nicholson co-wrote “Lucky Me, Lucky You,” which peaked at #35 and “All That Matters Anymore,” which stalled at #50. Sandwiched between them was “You Can’t Get There From Here,” written by Tony Arata, which reached #39. While I’m not crazy about the final single, the other two are excellent, and deserved to further Parnell’s radio career for at least another year. George Strait covered Parnell and Cris Moore’s “One Foot In Front of the Other” on It Just Comes Natural in 2006. Parnell’s vocal on the original is far less energetic than Strait’s, but the overall track is quite good. Trisha Yearwood joins Parnell on “Better Word for Love,” a surprisingly tender ballad. Her background vocal contributions to the track are wasted as she’s barely audible, and the song wouldn’t demand a close listen if she wasn’t a part of it. Parnell dives back into the Bob McDill songbook and pulls out “Tender Touch,” a steel and electric guitar soaked mid-tempo ballad that lacks the special touch McDill usually gives his compositions. He also revives Merle Haggard’s “Honky Tonk Night Time Man” from 1974. Parnell presents his version in Jam Band style, complete with electric guitar, but also stays true to Haggard’s original. It’s an excellent cover based on his mix alone. Guy Clark co-wrote “Baton Rouge,” an excellent country shuffle that suffers from Parnell’s unexpectedly weak vocal. 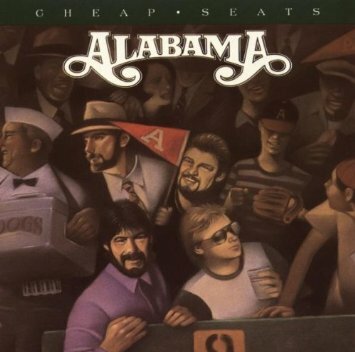 The title track is a typical workingman’s rocker and the album’s lone instrumental, the bluesy “Mama Screw Your Wig On Tight,” was nominated for a Grammy. Judging from the co-producing credit from Parnell’s road band, I expected Every Night’s A Saturday Night to retain the live energy of a concert, thus being excessively rock in nature. That’s probably a fact of the changes within the genre in the past seventeen years. I was pleasantly taken aback by how clean this album sounds, crisp and comfortable. Not every lyrical composition is a memorable masterpiece, but the overall quality of Parnell’s fifth album is very high. Lee Roy Parnell’s fourth album saw him repeating the pattern of the records which had seen him enjoy commercial success. There was one backroom change, though: a sideways move from Arista proper to the subsidiary imprint Career Records. The lead single ‘A Little Bit Of You’ is a mid-tempo love song with a radio-friendly tune, written by hitmakers Trey Bruce and Craig Wiseman. It just missed the top spot on the charts, peaking at #2. ‘When A Woman Loves A Man peaked ten spots lower, at #12, but I think it’s a better song. A classy soulful ballad, it features Trisha Yearwood’s backing vocals, although they’re quite low in the mix. ‘Heart’s Desire’ was another big hit, reaching #3. It’s an excellent example of one of Parnell’s slower numbers, rhythmic and blusey but not overwhelmingly so, with a mellow feel. ‘Givin’ Water To A Drownin’ Man’ proved to be Parnell’s last top 20 hit. It’s another strong track in Parnell’s wheelhouse, although the Merle Haggard namedrop seems rather random. The title track also got some airplay but didn’t make the top 40. It’s a mid-to-up-tempo chugger, stronger on groove than substance, but enjoyable enough. ‘Saved By The Grace Of Your Love’ is a gentle ballad written by Parnell with Mike Reid, which is very pretty. ‘I Had To Let It Go’ is a pretty good story song involving losing a loved one and giving up booze. The Delbert McClinton/Gary Nicholson song ‘Squeeze Me In’ is best known to country fans from Trisha Yearwood’s version. Parnell’s take is okay (and there’s some great piano), but I like Trisha’s better. ‘Knock Yourself Out’ has a blues groove which is quite catchy with call-and-response vocals and is quite enjoyable without being very memorable. It would have worked well live. ‘If The House Is Rockin’ is a straightforward slice of rock ‘n roll with exuberant honky tonk piano. The album closes out with an instrumental; featuring accordion great Flaco Jiminez. Not my thing, but impressive playing. Overall, a solid album which should appeal to anyone who likes the singles. Lee Roy Parnell’s debut album on Arista Records in 1990 was very different from the neotraditional style which was then at its peak, although not really unique (T Graham Brown was making quite similar music at the time, and doing well). The album was produced by Barry Beckett, a Nashville session man and producer whose roots lay in Muscle Shoals soul, and the combination of producer and artist was a good fit. Lee Roy’s rise coincided with the fall from favour with country radio of T Graham Brown, who had similar influences and musical stylings. Perhaps there was only room for one, and the newer guy would win out soon, but at the time of this release, Brown was still at his peak. Lee Roy’s first single, ‘Crocodile Tears, crept into the top 60. It’s a pretty good mid-tempo tune which he wrote himself, in which the protagonist rebuffs his wife’s insincere protestations of love, and at another time might have done better on country radio. Only marginally more successful, the second single. ‘Oughta Be A Law’ is a chugging mid-tempo country-blues-rock number written by Gary Nicholson with Dan Penn, with a prominent brass section. It is quite catchy, but not very country, and I can see why it didn’t catch on. Went out on a limb and fell off the family tree. I quite like ‘Fifty Fifty Love’, a solid tune written by Parnell and Nicholson, with a rhythmic groove which moves along nicely, although the horns are out in force again. ‘Mexican Money’ is an entertaining song about a blue-collar Texan planning to abandon the US, where he can’t make ends meet, to live with his Mexican sweetheart. The solemn ballad ‘Where Is My Baby Tonight’, written by Troy Seals and Graham Lyle, slows the pace, as does the bluesy love song ‘Down Deep’. ‘Let’s Pretend’ is a soul ballad. ‘You’re Taking Too Long’ picks up the tempo again, but isn’t very interesting. The closing ‘Red Hot’ is old fashioned rock n’ roll. Overall, this album is well done in its way, but it has quite a loose connection to country music and isn’t really my cup of tea with far too much brass rather than steel guitar. Fans of Lee Roy Parnell may be interested in exploring his earliest recorded work, but it probably isn’t the place to start. In era in which most artists only release new albums every two or three (or more) years, the ever-prolific Willie Nelson is back with a new collection, a mere eight months after the release of To All The Girls … Like all of Nelson’s recent releases for Legacy Recordings, Band of Brothers was produced by Buddy Cannon. It consists of fourteen tracks, eight of which were written by Willie and Cannon. Band of Brothers is vintage Willie. He thankfully makes no attempts to chase current commercial trends, but manages to make the songs sound fresh and bold, without sounding retro. He serves notice that he’s ready to take on just about anything with the album’s opening track “Bring It On”. “Guitar on the Corner” sounds like a song you think you’ve heard before, but it’s a brand new composition. “The Wall” sounds like the aftermath of “Bring It On”, the bravado having worn off and the protagnist realizing that he’s bitten off more than he can chew. “Wives and Girlfriends” is aperhaps a semi-autobiographical, tongue-in-cheek and slightly (but only slightly) exaggerated account of an apparent glutton for punishment who has had more love affairs than most of us have had hot dinners. In addition to the aforementioned Nelson/Cannon original compositions, Willie also enlists some help of a few prominent outside songwriters, including Gordie Sampson, Bill Anderson and Billy Joe Shaver. Sampson and Anderson contribute “The Songwriters”, which compares tunesmiths to heroes, schemers, drunks, and dreamers. It’s a perfect vehicle for Willie, one that I mistakenly assumed he’d written himself the first time I heard it. Jamey Johnson joins Willie on Billy Joe Shaver and Gary Nicholson’s “The Git Go”, which although well crafted, is a little too cynical for my liking. I prefer Shaver’s other submission “Hard To Be An Outlaw”, which again is a good match for Nelson. I’ve often said that Willie Nelson’s voice is an acquired taste and I will readily admit to not being a huge fan when I first became interested in country music in the early 80s. I remember having a conversation with someone who told me to take a moment to appreciate Willie’s skill as a guitarist. It wasn’t enough to win me over as a Willie fan at the time, but over the years I’ve come to realize that the person who told me this was right. Willie remains one of music’s most distinctive pickers and it more than compensates for the occasional moments when his 81-year-old vocal chords let him down. He sounds pretty good on most of the uptempo and midtempo numbers, but the wear and tear is apparent on the ballads, most notably his cover of Vince Gill’s “Whenever You Come Around”. This type of song needs a prettier voice than Willie’s but his guitar picking helps to salvage the track. Band of Brothers serves notice that Willie Nelson still has plenty to offer in the way of songs that are well played, well written, well produced and mostly well sung.